Surafel lives with his father and his mother. Running errands is his household duty. His father is sometimes employed as a subsistence farmer and his mother maintains the home. There are 2 children in the family. Surafel is not presently attending school. Singing, listening to music and hide-and-seek are his favourite activities. He also attends church activities regularly. Our love and support will help Surafel to receive the assistance he needs to develop his potential. Please pray for him. 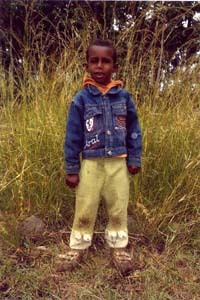 Surafel lives in the mountainous community of Derama, Butajira, home to approximately 7,000 residents. Typical houses are constructed of dirt floors, wood walls and thatch roofs. The primary ethnic group is Gurage and the most commonly spoken language is Guragigna. The regional diet consists of maize, wheat and teff (local grain). Common health problems in this area include HIV/AIDS and malaria. Most adults work as day labourers and earn the equivalent of £10 per month. This community has telephone services and water but needs electricity, vocational training centres, educational materials and recreation centres. Our sponsorship allows the staff of Wolensho Meserete Kiristos Church Student Centre to provide Surafel with Bible teaching, hygiene education, health screening, supplementary food, sports, social activities, educational materials, tutoring and tuition. The centre staff will also provide HIV/AIDS awareness programs and evangelism for the parents or guardians of Surafel. The latest letter from Surafel can be viewed HERE. The Sunday School children have written letters and drawn pictures in return. We have almost reached our target for the year but require a few extra pounds so that we can send money for a Christmas gift.